No Cold Calling Zones help combat the problem of doorstep crime. They can deter unscrupulous cold callers from approaching people living in the zones, but more importantly, they can give people the confidence to say ‘no’. 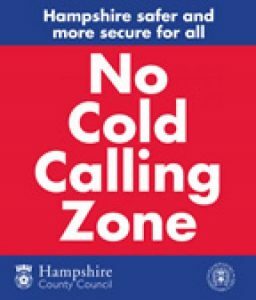 Whilst the zones do not ban cold callers or create exclusions zones, they can be useful in dealing with any unwelcome cold callers. Doorstep crime: What does it mean, exactly? This term is used to describe distraction burglary and rogue trading. Offenders knock on the door pretending to be someone else. They distract the resident to gain entry and steal items from inside, sometimes with an accomplice. Offenders may pretend to have lost a pet or claim they need to use your home phone. They may claim they are from a council, utility supplier, or even police. Lock: All doors, even when at home. Use a chain or spy hole. Stop: Unknown people from entering. Tell: Police about unwanted or suspicious callers, phone 101.